Best Full-Frame DSLR Expert: Canon EOS 5D Mark IVSelected for this year's "Best Full-Frame DSLR Expert" award, Canon's EOS 5D Mark IV DSLR offers impressive specifications. 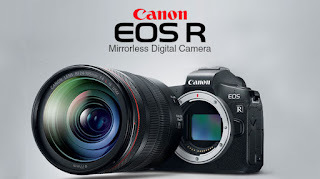 Equipped with an approximately 30.4 megapixel 35 mm full-frame Canon CMOS sensor and DIGIC 6+ image processor, the camera achieves a standard ISO sensitivity range of 100-32000 (expandable to ISO50-102400 equivalent), 7 frames-per-second (fps) continuous shooting of still images and 4K video capture at 30 fps, as well as full-HD video capture at 60 fps and HD 120 fps capture suitable for slow-motion video. Thanks to Dual Pixel CMOS AF, the camera achieves superlative high-speed AF tracking when shooting video and stills in live-view mode. The Canon EOS 5D Mark IV is equipped with 61 point high-density reticular AF II, achieving an expanded longitudinal focus area, with a maximum of 41 cross-type focus points of the total 61. Additionally, it features an approximately 150,000 pixel RGB+IR metering sensor. The camera also features a 4K frame capture function, which users can extract selected frames from recorded 4K video as approximately 8.8-megapixel JPEG still images, as well as built-in Wi-Fi, NFC and GPS functionality. Best DSLR Standard Zoom Lens: Canon EF 24-105mm f/4L IS II USMNamed "Best DSLR Standard Zoom Lens," the EF 24-105 f/4L IS II USM employs a new optical design that incorporates 17 elements in 12 groups, including four glass-molded aspherical elements—one of which features two aspherical surfaces. This standard zoom lens achieves improved peripheral light intake to achieve high image quality across the entire image field. The lens features image stabilization to the effect of 4 shutter speed stops and a circular 10-blade aperture that produces exquisite circular bokeh. Equipped with such features as inner focusing, a Ring USM (Ultrasonic Motor) and a high-speed CPU, and sporting an optimized AF algorithm, the EF 24-105mm f/4L IS II USM achieves highly responsive autofocusing. The lens also employs a special Air Sphere Coating (ASC), which reduces the occurrences of flaring and ghosting.